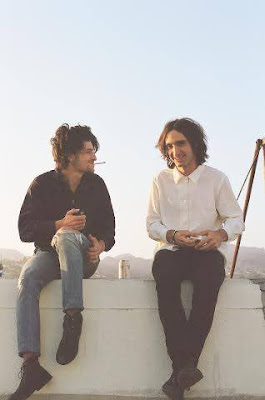 A few months ago I brought you word, here, on a track from Golden Daze, an L.A. duo consisting of Ben Schwab and Jacob Loeb. The band's debut full-length release is out tomorrow on Autumn Tone Records and I urge you to order it now after reading this brief review. From the opening Stereolab-out-west vibes of "Ghost" and up to the superb catchiness of "Never Comin' Back", the album starts off strong, strong, strong. This is, as I mentioned before, more or less the U.S. version of what U.K. act Childhood does so well. I lean on that comparison in order to avoid leaning on even easier comparisons. Many will write about the West Coast feel of this album, or the laid back grooves, which are abundant, but the music of Golden Daze is more than that. Think a happier, less nerdy Granddaddy, or the sound of Radiohead on vacation, their angst largely washed out in the summer sunshine. If stuff like "Foreigner" recalls the glory days of a bunch of 4AD bands from the early 1990s, then "Sleepin' in the Sun" hits a Jesus and Mary Chain-like near-roar that buoys up the song's peppy hooks. Fantastic stuff! At their best, Golden Daze transcend the trippy bits of material like "Low" with a strong sense of melody and a concise presentation. Too many bands would get lost in the bits on the edges of this sort of music and turn themselves into a shoegaze act that no one would want to hear twice but, thankfully, Golden Daze retain a firm grasp on the controls and keep things focused even as the music fuzzes out around them. Fans of Ultra Vivid Scene, for example, will thoroughly dig this release. Golden Daze by Golden Daze is out tomorrow on Autumn Tone Records. Follow Golden Daze on their official Facebook page.